I probably saw it on Pinterest first. I don't know. But the more I looked at it, the more I liked it. Say hello to my very own bullet journal. To learn more, check out the original here. I just started it this month, so it's not much yet. I actually started last month with just a habit tracker (I downloaded it from Boho Berry . It was sort of a test run to see if I could keep up with something for a whole month. And I did it. So the first pages of my bullet journal are monthly habit trackers for the rest of the year. I even use it for work. The tasks at the bottom are my daily things at work that I should remember to do...but I don't always because I have permanent Mommy-brain. The C and B are the corn and bean prices for the day, because I like to track that. It's the cash price here at work, not the CME price (because I'm sure you were dying to know). Then I track the high temperature for the temperature blanket I'm crocheting. The right is my #listersgottalist. Yesterday I started adding what I'm listening to (probably at the moment I write the entry, unless I want to record some other song that I can't get enough of). Then I go into my daily entry, which usually involves a description of the weather. You might notice my entries are pretty plain. I *try* to do the fancy handlettering, but I'm not very good at it. Yet. I actually bought this squared notebook to practice my handwriting. And I might. Someday. I'd like to try and make things pretty, but that's too stressful. So far, my only other miscellaneous entry is a list of movies I want to see with my kids. It probably came from one of those Buzzfeed lists. 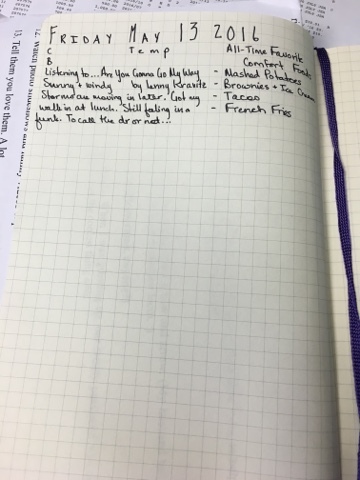 I think I want to add a page to track books I've read, songs I want to download, and whatever else strikes my fancy. I like the idea of a mood tracker...in theory. My mood changes a lot, so I'm not sure how that would work for me. I started using a different color ink for each daily entry. But it was too stressful picking a different color and finding a pen that wouldn't "ghost." So I'm sticking with LePen in black for dailies, for now. The Staedtler Triplus Fineliners also work pretty well (this is really just a way of enabling my pen and notebook addiction). At some point, I'd like to incorporate my gratitude journal. I started that last year as a way to keep myself in check. I write down at least one good thing about the day. I'm not sure yet what to do about a monthly 2016 calendar. I like the one I have (from Poppin ) and hate to start something new in the middle of the year. I like the idea of making my own planner. I don't have a lot of daily tasks and appointments that I have to track, so the monthly calendar style works best for me. I like to keep a journal and this helps me to write more often. 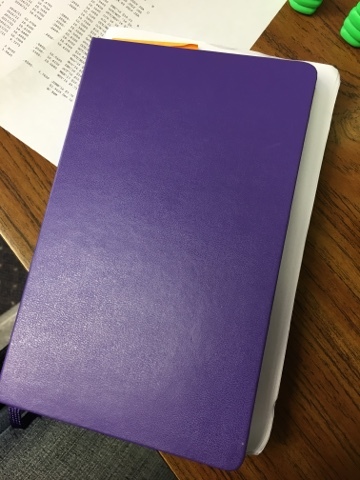 I'll probably still keep a regular diary-type journal separate from this for long drawn out ramblings. I like it that I can keep all of this in one place. So yay for not having to carry around 5 different notebooks. Has anybody else tried the bullet journal? Thoughts? Share your experiences. Check out my board on Pinterest here. 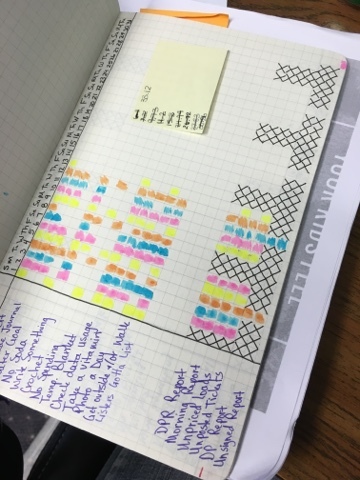 Send me some links to good bullet journal examples and sites you've found.